I can tell when I have had a particularly full travel schedule when many of my photos have been taken through windows. Scenes fly by out of plane and train windows. I grab my camera and try to take a shot out of the car window as something amazing flashes by or I curse the fact that I left the camera in the trunk with the rest of my stuff. Sometimes in the dying light of a day I arrive at my new ”home” and just manage to take a picture out of the bedroom window. Windows open and close giving me glimpses of people, places, life styles and personalities. I am nearing the end of the Australian visit. In a couple of days I’ll be making the long trek home. It feels weird saying that I will be going ”home”. On this visit, Australia has felt more like home than on any other I have made in the last 24 years. On other visits I have watched the places where I grew up become less and less recognizable. Sydney had become strange and foreign to me. A whole new younger generation had appeared in my absence and I was on the outside. This was especially true after my mother died in 2013. I came to realize that she was actually what represented home to me. She seemed to be the one comforting constant while everything and everyone else had changed and moved on. I guess I have adjusted my idea of what it is about Australia that represents ”home” to me because I really felt different about it all on this visit. I won’t attempt to figure out what has changed. I’ll just enjoy the warm feeling and be grateful for now having two places in the world in which to live that feel equally familiar and welcoming. I wove with friends in Sydney. We tackled warp-faced double weave. We had woven together on several occasions in the past and so everyone was up for this more advanced technique. We arrived early trying to shake off the Sydney winter chill. Lunch time would find us outdoors soaking up the warmth of the midday sun. Weaving warp-faced double weave on a backstrap loom involves a few more steps than those that are normally used to create pick-up patterns. This is what makes it a more advanced workshop topic. It is the method, rather than than the structure itself ,that makes it that little bit more challenging. Once the steps are mastered, students can move on very quickly to creating their own patterns. I call it ”doodling on plain-weave”. It is, after all, just two layers of plain weave on which we virtually ”draw” patterns. There aren’t any floats to consider. You can literally decide on the spur of the moment which of the two colors you want to pick without having to be careful about not creating a warp-float that is too long. Jen brought in a tablet-woven band that she had bought on a visit to Uzbekistan. 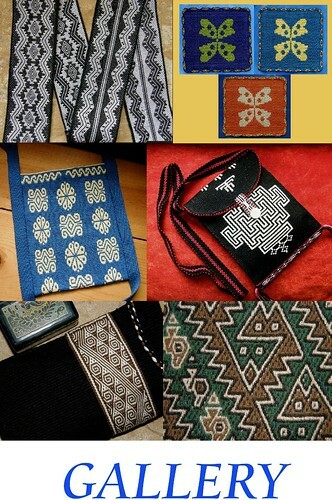 I had marveled at these bands that were being used to edge the magnificent Uzbek ikat garments that I saw at the International Folk Art Market in Santa Fe. Jen had bought her band in a street market in Uzbekistan. It is quite long and wider than the edging bands that had been used on the garments. I wonder what for what it was intended. Seeing these bands in Santa Fe had inspired me to weave one to use as the closure tab on a shoulder bag I was weaving. The piece in the middle is a wrist band that I bought at the Santa Fe market…a precious example that I could take home and study. On the right, you can see one of my first attempts to replicate it in heavy thread and, on the left, the final piece that I used on my bag. Because my piece was so short, I didn’t use tablets to weave it. I just set up a warp on my backstrap loom and twined the warp threads by hand rather than using tablets to do so. I only needed a few inches of band for my project. It was nice to be able to handle and examine one of these tablet-woven bands once again. My good weaving friend Emerald joined the group for the class. She usually invites me to her home in Sydney so we can weave together and it was nice to have her join the group this time. She bought my dvd Operating a Backstrap Loom and has returned home full of energy and ready to tackle wider warps. 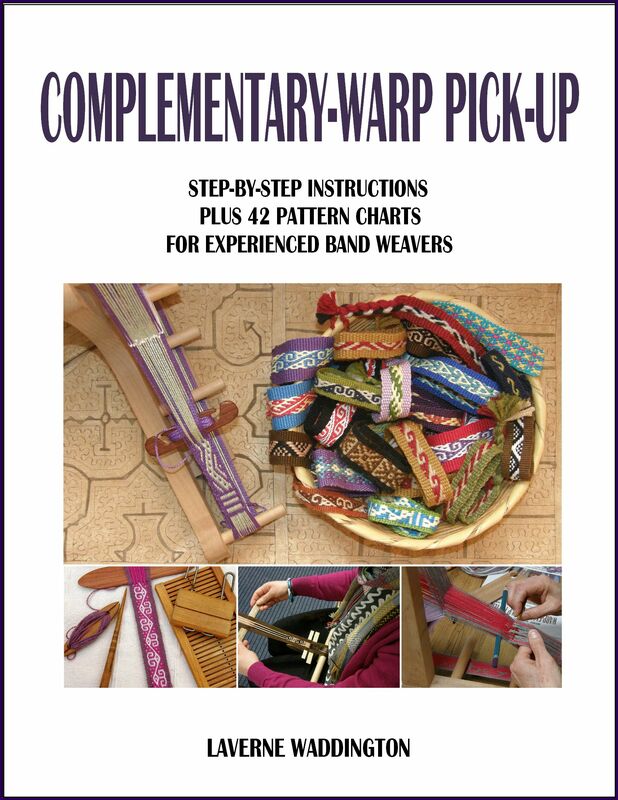 One of the topics on my dvd is about how to set up and operate a backstrap loom for wider warps. This seems to be just what Emerald was waiting for! Look at the gorgeous warp she has made… Emerald seems to get in quite a lot of practice between my visits. She was certainly the one who most quickly and efficiently made her heddles in the double weave class. She made heddles using nylon on her latest warp. Lots of weavers use nylon and love it. I have to confess, and you will have heard this before, that I really hate using nylon for heddles! I have nothing against the use of synthetic thread. I just prefer thread that has a bit of ”tooth” and grip. There’s a lot to be said for weaving a backstrap in plain weave. I love the flowing rhythm of plain weave. I think it is a great learning experience for the first steps in working with wide warps. Many people long to have a backstrap that is covered with pick-up patterns. That can come later. The first backstrap you weave will tell you a lot about what will be the ideal length, width and weave structure for the next one. Caroline’s warp looks great! I hope I will get to see it in person this October. A couple of days after the Sydney workshop, I took the train up north to Maitland to do some complementary-warp pick-up with a group of weavers who were taking their first steps in using a backstrap loom. I awoke to pretty mornings of heavy frost and fog drifting among the hills. I was nice and warm in Kerry and Graham’s beautiful mud brick house. The mud brick house was awesome! I don’t think I have ever been in a place where warmth was so evenly distributed. We spent happy snug evenings looking at the photos and textiles from Kerry’s recent trip to Bhutan. Magpies competed with kookaburras and rosellas to greet the day. I spent a good part of the early morning trying to record all that lovely birdsong before we headed out for a day of weaving. Galahs came to feed and a satin bower bird had built its impressive bower and comically decorated it will all kinds of blue objects. Painters tape, yarn and bottle tops, all of them blue, were among the treasures collected and strewn about to attract females to the harem. There’s my fabulous Maitland group. They were all there to greet me when I arrived and came in extra early on the second day so we could get even more done. No dawdling over lunch! Everyone wanted to pack in as much as they could on those two days…and we certainly did that! Di came down from the Gold Coast in Queensland to join us. Amanda came over from Tamworth, Liz came over from Morisset and Raelene traveled up from Canberra. Kerry, who hosted me in her home, will be going to the Tinkuy in Peru this November. If you are going, make sure to say hi to her for me. I think I might have helped her make the final decision on that one :-). From there I headed to Melbourne and Raelene followed me so she could have another class. Another window, another lovely view. They are not exactly the high rugged peaks that one might get elsewhere but I can tell you that the backcountry skiing on that range is superb! Melbourne: you may remember that I had woven with members of the guild in Melbourne last year. I had some familiar faces in the workshop as well as a bunch of new ones. I was happy to be back staying with Ruth in North Carlton surrounded once again by all those gorgeous terraced houses with their wrought iron railings and fences. That reminds me that a plan to weave some of the wrought iron patterns is still on my list of things to do. The late evening arrival gave me a pretty sunset view over wrought iron spires from my bedroom window. The other window in my bedroom looked out over the Melbourne skyline. 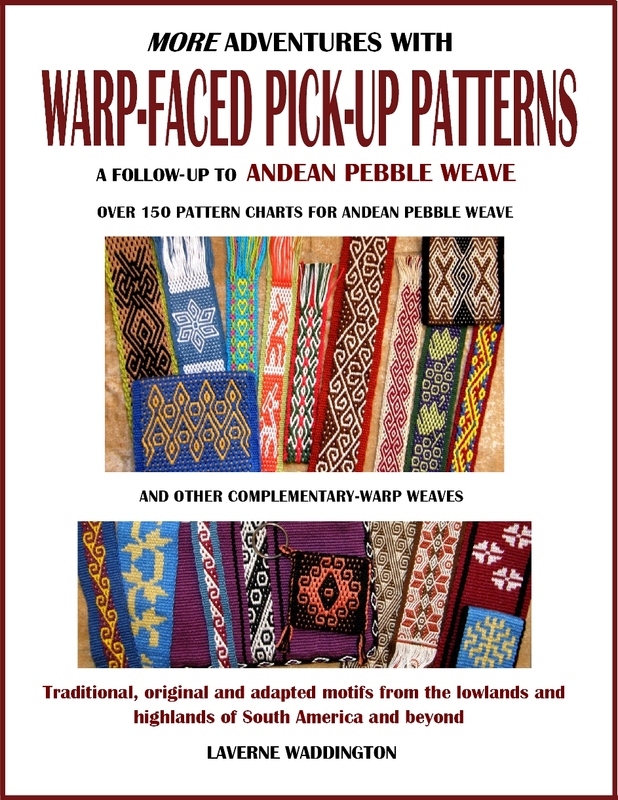 Last year, we had two three-day classes on Andean Pebble Weave and this year we decided on complementary-warp pick-up. Raelene was coming from having just taken that very same class in Maitland but I had plenty up my sleeve to keep her challenged. We had two first-time weavers in that class…not just first-time backstrap weavers. They had never done any kind of weaving at all and they did so very well! When not weaving with a backstrap loom at the Guild, Ruth showed me how she has been doing pick-up weaving on her inkle loom. She took the Andean Pebble Weave class with me last year and has been continuing to make bands using her Ashford inklette. It’s interesting to see Ashford’s new version of the inklette with its sliding tensioning system rather than the one that used a paddle. She has one loom, the nearest, set up for Andean Pebble Weave (she is weaving the little pre-columbian bird motif that is charted in my first book). The other loom is set up to weave the intermesh structure which she learned from my second book. Here she is doing some pick-up on the intermesh warp.. This picture was taken late on the second day of our workshop when energy can sometimes be flagging. Everyone is very absorbed with getting the new wider and more complex patterns started on the fresh warps that they had created and set up themselves. She doesn’t have much room left to weave on that particular warp but she has several more bands that were started in the two classes to complete. But, I am getting ahead of myself! First stop in Tasmania was up north in Launceston. From there I headed a bit south-west to weave with a group in Deloraine. I stayed with Jutta and Heinz in the pretty village of Chudleigh. It was cold in Tasmania…but of course! I didn’t get to see the surrounding hills on the first morning because of the cloud and fog but I was blown away by the magnificently clear night sky when I arrived. It was lovely seeing the Southern Cross way overhead among the stars of the Milky Way. In Santa Cruz Bolivia where I live, the Southern Cross appears just above the horizon. The tails of fog drifting along the fields and hugging the hills in the early morning were really attractive. After class on the first day, Jutta drove me around to see the pretty dairy pastures that surrounded Chudleigh village. After two days spent with the weavers in Deloraine, it was time to head on down to Hobart. Jutta made many stops along the way to show me around. We visited Launceston and its Design Centre. There we saw an interesting exhibit of wood that is being reclaimed from the bottom of valleys that were long ago flooded for hydro-electric schemes. Massive tree trunks are being turned into furniture by Tasmanian artists. In the gift store, Jutta bought and gave me a shawl pin made from Tasmanian huon pine. The point of the pin makes it a perfect little pick-up stick. I had bought a kitchen implement made from Tasmanian sassafras wood which I hope to have modified into a sword. We visited a few historic sites along the way like the Callington flour mill in Oatlands which was built in 1837. I wasn’t expecting to see a windmill in Tasmania! The Hobart guild has its rooms in Battery Point, an absolutely gorgeous part of the city full of pretty Georgian stone cottages and houses made from convict brick. The houses were built for early-Hobart workers and merchants of the port. The guild rooms have a shop, a library and spacious well-lit rooms for workshops and gatherings. My group surprised me with a lovely gift…a needle case made out of Tasmanian myrtle. I got to stay on Mt Nelson with Margot which gave me pretty views of the river and bridge and then I swung over the river to Lindisfarne to stay with Jillian. Her historic home offered views of the bridge and the famous mountain that was slowly emerging from its shroud of cloud and fog. Jillian does all kinds of weaving but has spent a lot of time on tapestry. She shared some of her works with me. I was really taken by this miniature that she wove while seated in a botanical garden. I have seen people with their easels painting outdoor scenes or sketching or using pastels (I have always been so envious of those skills!) but the idea of weaving a scene like that, painting with yarn what is right before your eyes, just blows my mind. It was a very happy reunion seven years later! I was tickled to see the fob on Anna’s car key. 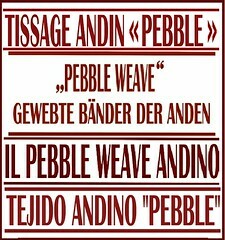 This is an Andean Pebble Weave band that she had warped and used to learn to weave with me at my place back in 2010. This last remaining shred of band is now her keyfob!…. And, look what she has been doing with those double weave skills! Much has happened since we met in 2010. Anna and Alistair got married after their three years of bicycling through North, Central and South America, moved to Tasmania and now have two little ones. Anna and I strolled around Battery Point together catching up while looking at the historical houses. Hobart has over 300,000 inhabitants and I felt like I could see the homes of each and every one of them from up there! There’s that elusive summit….at last! She plans to make bracelets with I-Ching hexagrams. Thank you again for this nice story. I admire your energie traveling so much and so far. Thank you for the beautifull pictures and the birdsong! When i saw the cloting of the women I realized it is winter in that part of the world while we have summer in the Netherlands. I was able to fasten my weaving outside on a tree and weave in the shade of a cherrytree on the camping were we are. Last winter I have teached bandweving to a group. They are very enthousiastic but in the beginning found it very difficult. So we did a lot of plain weave in the beginning to learn to controll width and work with colors. I was very proud when some of them managed to weave a pebble pattern! Totally inspiring and interesting. I’ve not been to Australia yet, but your descriptions gave me itchy feet. You have really covered a lot of territory and met and wove with so many people! I enjoy all your photos and descriptions of places from Victoria to Tasmania! 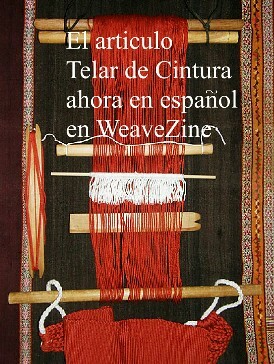 It’s fun to see all the weavers and their projects and the new techniques they are learning. I hope I can be one of them someday! What a wonderful post. I felt like I was traveling with you. Glad you got so many wonderful experiences. I do think I look just a tad older now! those were the days. 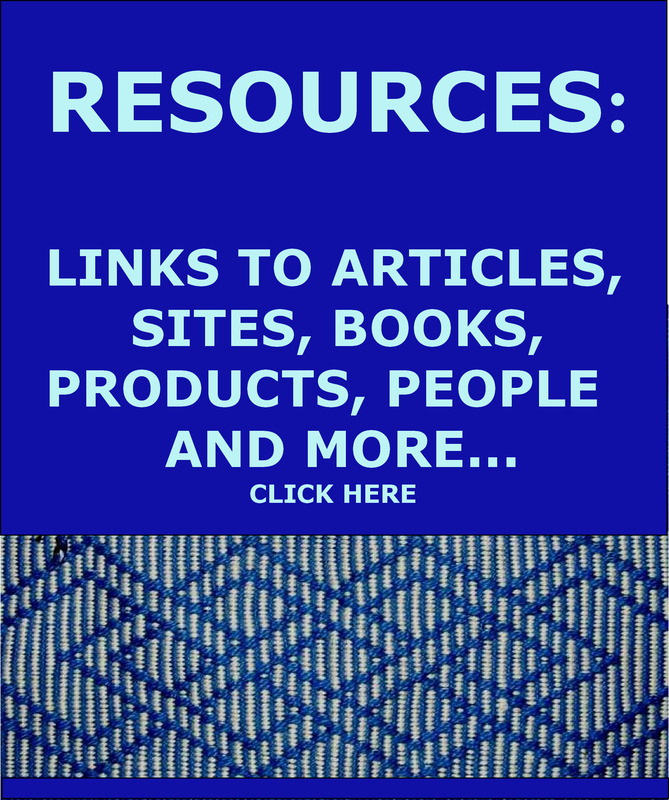 Do you know about Stitching and Beyond? I shared an image of your lovely work on their FB site. No, I didn’t know about that site. Thanks for telling me and thanks for sharing my work.